Augmenting creative performance has the potential to benefit both the individual and our society. Several studies have evaluated the impact of different behavioral training or induction methods on creativity. However, the findings are mixed and sometimes contradictory. Four different short-term induction methods which differed along two information processing dimensions—modality and demand—were compared within a single experimental paradigm alongside a non-induction control group to determine which was the most effective at improving creativity. A comparison on the experimental inductions revealed that low-demand induction methods boosted creativity more than high-demand induction methods. However, this pattern was not maintained when comparisons included the non-induction control. These findings provide insights on important factors and control variables that need to be taken into account at the level of experimental design in order to be able to evaluate the efficacy of different induction and training methods on creativity. Several studies have examined whether creativity can be improved by means of assorted behavioral training or induction methods, which differ along parameters such as modality type (cognitive, motor) (Oppezzo and Schwartz 2014; Radel et al. 2015) and context (active task, passive exposure) (Dugosh et al. 2000; Dumas and Dunbar 2016). What is being “induced” through these methods is a change in one’s customary pattern of information processing, and what is examined is whether this altered state of functioning abets behavioral performance on a given task. Domain-general methods focus on heightening the engagement of general information processing mechanisms with a view to estimating the impact of doing so on creative cognition. For example, in one episodic specificity induction protocol (Madore et al. 2015) participants view a ~2-min video of people engaged in household activities. Following this, the participants are presented mental imagery probes to report details concerning the events in the viewed video with as much specificity as possible. Such episodic inductions are believed to enable wider and deeper access to representations and this retrieval of detailed information is held to abet creative performance (Dugosh et al. 2000; Madore et al. 2015). These are distinct from domain-specific methods, such as enhancing verbal creativity by training specific verbal skills (Fink et al. 2010, 2015) (e.g., make slogans for a new product: orange ice cream). Most induction techniques have focused on “training up” mental operations, but some take the opposite approach by “disrupting” information processing in some way to improve creative cognition. In line with evidence showing that cognitive disinhibition can be advantageous for creative performance (Abraham 2014; Carson et al. 2003), exhausting attentional resources prior to undertaking a creativity task led to better performance (Radel et al. 2015). However, such findings are in direct opposition to other well-established evidence, namely that upon reaching a mental deadlock, undergoing an incubation phase facilitates one’s ability to reach creative insights (Gilhooly 2016; Sio and Ormerod 2009). During incubation, attention is directed away from a problem through rest or by engaging in monotonous or undemanding activities. So the evidence appears paradoxical as it indicates that conditions of both high and low processing demands can improve creativity. Little is known about the parameters by which creativity can be facilitated by both these situations. Other factors during training or induction can also vary. Motor or cognitive induction can bestow advantages on creative performance (Colzato et al. 2013; Fink et al. 2010; Oppezzo and Schwartz 2014; Sun et al. 2016). The time point of the induction is also variable; either (A) prior to introducing the creativity task (e.g., Madore et al. 2015), (B) after the instruction to the creativity task but before task performance (e.g., Dijksterhuis and Meurs 2006), or (C) during the performance of the creative task (e.g., Oppezzo and Schwartz 2014). This is of especial significance given that the inductions could occur during different phases of the problem-solving cycle (Preparation→Incubation→Illumination→Verification) (Wallas 1926), such that inductions are implemented prior to the Preparation phase (as in situation A), during the Preparation phase (as in situation B), or during the Incubation phase (as in situation C). The duration of induction can also vary with effects seen after a short period (e.g., within one session, < 5 min session duration) (Dijksterhuis and Meurs 2006) or a long period (e.g., after multiple sessions, > 5 min session duration) (Sun et al. 2016). Lastly, the measures of creativity also differ between studies with some contrasting divergent and convergent tasks (Colzato et al. 2013; Oppezzo and Schwartz 2014; Radel et al. 2015) while others explore relevant metrics within divergent thinking, such as ideational fluency (Madore et al. 2015; Radel et al. 2015) and ideational originality (Fink et al. 2010; Oppezzo and Schwartz 2014). So there are multiple influences at play that need to be teased apart in order to derive a clearer picture of the effects of training/induction methods on creative cognition. The key question to seek answers for is which short-term induction methods work better than the others at improving creative performance, and what are the conditions under which creativity is facilitated or reduced. The need to critically consider the nature of the control task or comparison group to the induction condition is also of relevance. Some studies only employ one induction condition/group in comparison to a non-induction condition/group (e.g., walking versus sitting: Oppezzo and Schwartz 2014; cognitive stimulation 20-sessions training group vs no-training control group: Sun et al. 2016). In the absence of a second experimental or control induction condition/group, it cannot be maintained with high certainty that the seen improvement is specific to the information processing dynamics associated with that induction activity as opposed to the effect of merely doing something different from the ordinary. On the other hand, in the studies that do compare more than one type of training or induction, many do not employ a no-induction control group as they seek to compare the efficacy of two different inductions with one another (e.g., episodic specificity vs non-imagery: Madore et al. 2015; high inhibition vs low inhibition: Radel et al. 2015). The disadvantage of this approach is that it is not apparent whether the enhancement in performance attributed to the inductions in question was in effect better, worse, or indistinguishable from having no induction prior to or during performance. In this explorative study, we devised a novel paradigm that enabled the comparison of multiple short-term active domain-general induction methods within a single experimental design. This is operationalized by means of 2 × 2 between-groups factors, where the first reflects modality of induction (Motor, Cognitive), and the second reflects the level of information-processing demand associated with induction (Low, High). We tracked the effect of these inductions, which took place prior to the creativity task (situation A as described above), across a series of trials (within-subjects factor) on three dependent measures of divergent thinking using an adapted alternate uses task (Guilford et al. 1960; Runco et al. 1987): Fluency (number of generated uses), Overall Originality (uniqueness of generated uses), and Peak Originality (proportion of highly original uses). We also tested a separate group of participants who did not undergo any induction procedure to evaluate how the differences in creative performance associated with specific induction activities were borne out when contrasted with that of a no-induction control group. This experimental design allows us to determine which of these inductions, if any, are the most advantageous in relation to different facets of creative thinking. The findings in turn would reveal which types of changes in information processing would abet creativity. For instance, better performance following high-demand inductions would implicate support for the notion of positive biases and outcomes associated with “disruptive” changes (e.g., Radel et al. 2015), whereas better performance following low-demand inductions would implicate support for the opposite premise (e.g., Sio and Ormerod 2009). One hundred and fifty-nine individuals took part in the study across two separate phases and obtained either a modest monetary incentive or course credit for participation. Of these, 140 people participated in the first phase (only the four experimental induction groups) and 19 participated in the second phase (only the no-induction control group). Nine participants were omitted from the analysis as they did not meet either the eligibility or inclusion criteria: over 30 years of age (n = 3); left-handed (n = 1); failure to understand motor–high-demand training instructions (n = 1); high error rate of over 20% in cognitive induction tasks (n = 2); incomplete performance on the standard progressive matrices (SPM) (n = 1); and an SPM score that translated to an IQ below 85 (n = 1). The final sample included 150 participants (120 female, 30 male). These were divided into 5 groups depending on the induction condition they underwent (motor–low demand: n = 29, motor–high demand: n = 31; cognitive–low demand: n = 34; cognitive–high demand: n = 37; control–no-induction: n = 19).1 The protocols of the study received ethical approval from the Local Ethics Board at Leeds Beckett University. Participants provided socio-demographic information (e.g., gender, age). The following tasks were administered. Edinburgh Handedness Inventory (revised): This measures the use dominance of the left or right hand in 7 everyday activities (Oldfield 1971; Williams 2013). Gough Creative Personality Scale: This measures creative personality (Gough 1979). Participants tick all adjectives from a list of 30 that describe them, to obtain a total score. Abbreviated Torrance Test for Adults (ATTA): This measures creative ability (Goff and Torrance 2002). Following the manual guidelines, two raters independently scored each participant’s response. The total score was derived from the norm-referenced measures of fluency, originality, elaboration, and flexibility. Criterion-referenced indicators were not scored. Cognitive Induction Tasks: 244 sentences with the last word missing (e.g., The captain stayed with the sinking ___.) were modeled on stimuli from the Hayling Sentence Completion Task (Burgess and Shallice 1997), a neuropsychological test to assess verbal response initiation (Low Demand) and inhibition (High Demand) (Collette et al. 2001). Participants were asked to complete as many sentences as they could within a 10-min period. The Low Demand group had to provide the correct word (e.g., ship) that would appropriately complete each sentence and two scores were obtained: total number of sentences completed, and number of sentences completed correctly. The High Demand group had to provide a word that is unconnected or not meaningfully linked to each of the sentences (e.g., rub), and three scores were calculated: total number of sentences completed, number of category A errors (meaningfully connected word) and category B errors (semantically connected word). Motor Induction Tasks: A neutral document (university statute) was provided and participants were instructed to copy out the text neatly and legibly for a period of 10 min. The number of lines completed was recorded. The Low Demand group used their right hand. The High Demand group used their (non-dominant) left hand and the text to be copied was presented upside down. Alternate Uses Task (AUT): This is a test of divergent thinking (adapted from Guilford et al. 1960). Participants were asked to think of as many new and different uses as possible for six common objects: newspaper, brick, paperclip, knife, shoe, and light bulb. There was a time limit of 2 min for each item. Three scores were calculated from the data for each participant. Fluency is the total number of acceptable responses. 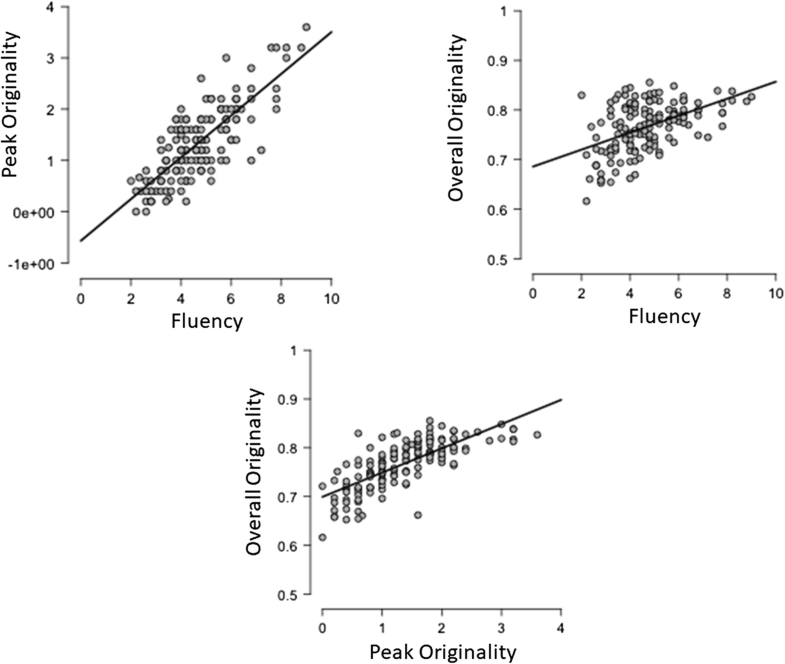 Overall Originality is the uniqueness of the generated uses which was calculated from the proportional weighting of each use by the frequency of its occurrence or the weighted fluency score (Abraham et al. 2012; Runco et al. 1987). Peak Originality is the number of highly original uses (generated by less than 10% of the sample) that were produced by the participant. Only the first five trials were assessed further as there was a substantial drop in number of participants who completed the sixth trial (n = 123) compared to the previous trials (range of n = 148–150) particularly among the experimental induction groups, which suggested the setting in of fatigue after the fifth trial (missing n in Trial 6: cognitive–high demand = 6, motor–high demand = 7, cognitive–low demand = 10, motor–low demand = 3, control = 1). Raven’s Standard Progressive Matrices (SPM): This non-verbal 60-item test measures cognitive intellectual capacity (Raven et al. 2000). The scores were translated into IQ values using a published conversion table (Jensen et al. 1988). The data was collected within group testing sessions in the university. Participants were pseudo-randomly assigned to one of four areas as they entered the testing room, one area for each of the four induction task types, with care taken to counterbalance the gender distribution across groups. The testing was conducted in four phases. In phase 1, participants were instructed to complete tasks 1–3. The assigned induction task was carried out in phase 2 and the AUT in phase 3. In phase 4, participants completed Raven’s SPM. A control no-induction group was tested at a later point in time as it became apparent that it was necessary to have such a group to ascertain whether the differences in creative performance associated with the induction were better, worse, or no different from having no induction as all. The only difference in procedure for the group was the absence of phase 2. All five groups (four induction and one control group) were not significantly differentiable in terms of gender distribution (χ2 = 0.15, p = 0.82), age, handedness, IQ (SPM), creative ability (ATTA), handedness, and creative personality (all F4150 < 1.64, all p > 0.1) (Table 1). The motor–high demand group (mean = 5.91, SD = 1.33) copied significantly fewer lines than the motor–low demand group (mean = 19.34, SD = 3.86) within the induction period, indicating that the former induction method was more taxing (t59 = 18.55, p < 0.001). The cognitive–high demand group (mean = 56.3, SD = 17.86) finished significantly fewer sentences than the cognitive–low demand group (mean = 115.1, SD = 31.9), indicating that the former was a more challenging induction method (t71 = 9.745, p < 0.001). The implementation of the induction methods with regard to the dimensions of demand was thereby successfully operationalized. The first set of analyses involved comparing responses only on the first trial of the alternate uses task directly after the inductions (Table 2). This was in order to discern the immediate impact of the inductions on creative performance. ANOVAs on the three dependent measures with induction modality and induction demand as the fixed factors revealed that two significant findings, namely the significant impact of induction demand on overall originality (F1127 = 8.707, p = 0.004, η2 = 0.064) and peak originality (F1127 = 7.262, p = 0.008, η2 = 0.054). This indicates that the low-demand inductions (both cognitive and motor) were associated with greater levels of originality in the first trial directly after induction. So when looking for immediate effects of induction, low-demand inductions are associated with higher levels of overall originality and peak originality. However, including the no-induction control within the analyses rendered these findings inconclusive. ANOVAs across the three dependent measures with training type as the fixed factor reveal that the performance of the induction and non-induction groups on the first trial are not significantly differentiable in terms of fluency, overall originality, or peak originality (all F4145 < 2.3, all p > .05). So whatever advantage is associated with the low-demand inductions compared to high-demand inductions on creative performance is negligible when contrasted against performance at baseline, i.e., in the absence of a prior induction method (Fig. 1). The next set of analyses were carried out to compare the influence of the induction methods across the five trials in order to determine which types of induction were generally associated with an significant impact on creativity across the testing session (Table 2). ANOVAs on the three dependent measures with induction modality and induction demand as fixed factors revealed only one significant finding, namely the impact of induction demand on fluency (F1127 = 4.35, p = 0.039, η2 = 0.03), indicating that the low-demand inductions (cognitive and motor) were associated with greater levels of fluency. So when looking for wide-ranging effects by averaging across the testing session, low-demand inductions are associated with higher levels of ideational fluency. However, including the no-induction control within the analyses rendered these findings inconclusive. ANOVAs across the three dependent measures with training type as the fixed factor reveal that the performance of the induction and non-induction groups across trials are not significantly differentiable in terms of fluency (F4145 = 1.665, p = .161). So whatever advantage is associated with the low-demand inductions compared to high-demand inductions in ideational fluency on creative performance is negligible when contrasted against performance at baseline, i.e., in the absence of a prior induction method (Fig. 2). Furthermore, there was a significant effect of training type on overall originality (F4145 = 4.118, p = .003, η2 = 0.102). Post-hoc Tukey’s tests confirmed that the control no-induction condition was associated with the higher overall originality than all four induction tasks (all t > 3.11, p < .05) (Fig. 2). So in the case of overall originality across the testing session, inductions prior to creative performance, particularly in the case of the high-demand inductions, appear to be detrimental to creativity. Also noteworthy in this context are the highly significant and positive correlations between fluency and overall originality (Spearman’s rho = 0.461, p < 0.001) as well as fluency and peak originality (Spearman’s rho = 0.746, p < 0.001), which is consistent with previous findings that higher ideational output (fluency) is associated with greater originality in creative thought (Jung et al. 2015) (Fig. 3). This block of analyses focused on trial-by-trial responses on the dependent measures (Table 2). This enabled an understanding of the dynamics underlying the influence of the induction methods through the trial series. Repeated measures ANOVAs (2 × 2 × 5) were carried out with induction modality (motor, cognitive) and induction demand (high, low) on the three dependent measures across 5 trials. The findings indicate that, across all groups, fluency reduced over the course of series of trials (main effect: F4492 = 86.76, p < 0.001, η2 = 0.409) (linear trend: t = 16.04, p < 0.001), with the low demand groups showing higher fluency than the high demand groups across all trials (group main effect: F1123 = 4.125, p = 0.044, η2 = 0.032). While including the no-induction control within the analyses led to the disappearance of this significant group main effect, the main effect for ideational fluency reducing over the course of the five trials remained significant (F4564 = 79.303, p < .001, η2 = 0.351) (Fig. 4). In contrast, overall originality showed a dip following the first trial and then an increase across the trial series with highest levels of Originality in the last trial (main effect: F1123 = 13.57, p < 0.001, η2 = 0.095) (quadratic trend: t = 5.96, p < 0.001). There was also a significant interaction effect between trial × induction demand (F1123 = 4.6, p = 0.001, η2 = 0.032), such that low-demand inductions were associated with higher originality in the first trial and lower originality in the last trial compared to the high-demand inductions. Including the no-induction control within the analyses rendered the group related findings inconclusive. The increase in overall originality over the trial series was confirmed (Trial main effect: F4564 = 16.627, p < .001, η2 = 0.1). While the groups significantly differed from one another in overall originality across trials (Group main effect: F4141 = 4.103, p < .001, η2 = 0.104), post-hoc Tukey’s tests indicated that the control no-induction group was associated with greater overall originality across trials than the four experimental induction groups (all t > 3.19, all p ≤ .015). There was also a significant interaction effect between group and trial (F16,564 = 1.989, p = .012, η2 = 0.048) which was driven by a greater differentiation in the performance of the control group compared to the induction groups in exhibiting the greater originality each subsequent trial (Fig. 4). Peak originality was associated with a dip following the first trial and then a sharp increase which flattened across the remaining trials (main effect: F1123 = 6.12, p = 0.047, η2 = 0.091) (quadratic trend: t = 3.996, p < 0.001). This pattern was maintained even after including the no-induction control within the analyses (main effect: F4564 = 8.308, p < 0.001, η2 = 0.055) (quadratic trend: t = 4.065, p < 0.001) (Fig. 4). The results from trial-based analyses can be summarized as follows. Regardless of induction method, participants were able to generate many more uses in early trials compared to later trials and they got better at generating more original responses with time. The increase in originality over time fits with evidence that strategies used later in the use generation phase are associated with greater levels of originality (Beaty and Silvia 2012; Gilhooly et al. 2007). While such studies examined the changes in originality as a function of time course within single trials, the current study is the first to show an increased efficiency in ideational originality over time across the course of multiple trials. What this response pattern reflects is still an open question. Candidate factors include the use of better cognitive strategies over time or increased disinhibition owing to fatigue over time. There were also no advantages associated with experimental inductions on fluency, overall originality or peak originality. In fact, in the case of overall originality, inductions prior to creative performance appear to be disadvantageous for creative cognition. A caveat in relation to the trial-by-trial analyses is required at this juncture. As trial order was not counterbalanced across participants, it could be the case that the findings reflect item-specific responses rather than a time course effect. While we believe that the former interpretation is unlikely especially when considering that the pattern of ideational fluency with each subsequent item was not haphazard but instead followed a smooth trend, we acknowledge that it is not possible to rule out this item-specific interpretation. This therefore constitutes a shortcoming of the present study. By carrying out different levels of analyses, the current study provides a rich set of findings from which to interpret the impact of different short-term induction methods on creative performance. The trial-by-trial response analyses allow us to determine the dynamics of influence by the inductions. The average response analyses allow us to determine the overarching effect of the inductions. And the response analyses from the first trial following induction allow us to pinpoint the immediate consequence of the inductions. If one were to not take the impact of including a non-induction control condition, the findings would be in line with the extensive literature on the positive effects of incubation on creativity (Gilhooly et al. 2012; Sio and Ormerod 2009), as they speak to the positive impact of low-demand tasks in abetting creative performance. 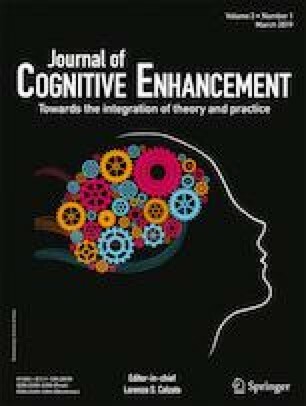 Some previous evidence has demonstrated that high cognitive or motor demand activities hinder creative output, whereas low cognitive or motor tasks facilitates creative output (Colzato et al. 2013; Gilhooly 2016; Ritter and Dijksterhuis 2014; Sio and Ormerod 2009). The advantage associated with motor–low-demand induction was more sustained in the case of ideational fluency in creativity, as it was associated with greater levels of fluency in creative performance across all trials. This would fit with evidence that showcases the positive influence of undemanding motor activities, such as walking, on creativity (Oppezzo and Schwartz 2014). The current findings then do not align seamlessly with the opposite line of evidence (Radel et al. 2015) namely that depleting information-processing resources leads to an improvement in creative performance, which would be expected given the hypothesis of the positive impact of mild disinhibition on creativity (Abraham 2014; Carson et al. 2003). However, including a non-induction control leads to considerable upheaval of the findings. The effects in relation the inductions were in large part not significantly different from having no induction at all. And in the few cases were differences were apparent, the advantages were associated with the non-induction control condition, particularly in the case of overall originality in creative thinking. In summary, the results of this study showcase a number of important considerations in relation to training or induction-based studies and their proven efficacy. At the outset it is important to specify which phase of the problem-solving process is being targeted by the inductions—prior to the preparation phase, during the preparation phase, or during the incubation phase. The current study examined the impact of different inductions prior to the preparation phase. Furthermore, experimental paradigms should include more than one experimental induction method alongside a control non-induction baseline to be assured of the soundness and clarity of the conclusions. It would also be more efficacious to have a within-subjects implementation of a non-induction control condition so as to overcome further avenues for variability to be introduced to the dataset. In addition, the findings point to the need to consider differences in the underlying temporal dynamics in relation to different key aspects of creative thinking—fluency and originality—as these were associated with different patterns of findings. Bearing in mind that the capacity to be creative is vital to innovation in all spheres of human enterprise (Dutta 2012; Fogarty et al. 2015), quick and accessible strategies that could enable us to enhance our creative performance, even in the short term to overcome immediate impasses during creative idea generation would be very useful. However, in order to uncover stable and sound strategies to this end, it is vital to have the necessary checks and controls in place when evaluating the efficacy of training/induction activities. Statistical power was not formally assessed in establishing the required sample size for this study. Instead, we aimed to recruit to sample sizes that are typically reported in induction/training studies (e.g., n = 24: Madore et al. 2015; n ~25 per training group: Fink et al. 2015). This work was supported by the Research Sector of Kuwait University under Grant MC 01/13 awarded to AA and AKB. Abraham, A. (2014). Is there an inverted-U relationship between creativity and psychopathology? Frontiers in Psychology, 5(750). https://doi.org/10.3389/fpsyg.2014.00750. Gilhooly, K. J. (2016). Incubation and intuition in creative problem solving. Cognitive Science, 1076. https://doi.org/10.3389/fpsyg.2016.01076. Sun, J., Chen, Q., Zhang, Q., Li, Y., Li, H., Wei, D., … Qiu, J. (2016). Training your brain to be more creative: brain functional and structural changes induced by divergent thinking training. Human Brain Mapping. doi: https://doi.org/10.1002/hbm.23246.